I used to love doing to-do lists, the longest the better, until my coach introduced me with the To Be List concept a few years ago—which now I love and stand for. I used to feel accomplished every time I could check an item on my long to-do lists as a symbol of the work done. I could be in the shower, laying on my bed, working at the computer, or driving, when I surprised myself doing lists on my head. One summer night, I was reviewing one of my lists and I couldn’t stop thinking how much work we moms do every day. I felt grateful for my mom, who sacrificed many things for my siblings and me. I felt grateful for you and for every mom in the world who day after day add value to the lives of their families. And I felt blessed to be a mom myself. While I was checking the long to-do list, I also realized that every single activity we do shows one or more skills we have, and most of the activities in a mom to-do list relate to one skill that we moms usually don’t credit ourselves for: finances. Based on these facts, I felt urged to improve moms’ financial confidence. According to a survey conducted by Prudential in 2014, fewer than 2 in 10 women feel “very prepared” to handle their finances, what indicates the lack of confidence most women have because they believe they don’t have the skills needed. Taking into consideration that Skill is: “the ability, coming from one’s knowledge, practice, aptitude, etc., to do something well”; I can tell moms have more financial skills than they think. The following facts are based on the to-do lists we moms do and they will improve moms’ financial confidence, by letting moms like you aware of all that you know and how it can be applied to your finances. As mom you are usually in charge of taking your kids to see the doctor. Every time you go to one of your children´s appointments it shows that you are capable of setting a date and honoring it. This time management skill you have could be related to a financial skill required to keep a record of payment due dates in order to fulfill them on time, helping you build a good credit score and avoiding to pay extra money. The fact that you now have water to take a bath, electricity, an Internet connection, a cellphone and many others items and services right now, reflects that you are able to make payments when it is required, so you are good in finances. Planning the meal menu for the week is an activity that helps us eat healthier and save time and money on a daily basis, but this is not one of my favorite activities to do. However, I do it with love for my family, and I know you can do it too. Once you have the weekly meal menu ready and you buy all the groceries you’ll need, it is easier to make ends meet. The skill required to do the planning of weekly meals is similar to planning your family budget, which is an important step to manage your finances wisely, and you have it! Every time you sit down to review your children’s school assignments, to contact their teachers to know if everything is going well with them, or every time you get into their closets to identify the clothes that don’t fit anymore an you manage to update their clothing, you’re proving that you can follow tasks that are more complex than financial products, so you’ll be great at tracking your finances. I remember a Stock Management class I took in my college years. One of the forms for goods stocking is called “first in, first out” and when I first learned about it I knew that, even though my mother hadn’t gone to college, she had taught me the same lesson to streamline resources with the groceries in our kitchen, many years before. “You need to move the items in the fridge and into the kitchen cabinets, putting the oldest in front and the newest in the back in order they can be fresh for more time”. This may be the same principle you apply to the perishable goods in your kitchen. The same way companies streamline their resources by rotating their products, you are saving important sums of money and streamlining yours by doing the same. This skill equipped you to be more efficient with the use of your budget, your money and any other resources you have to manage. Have you ever had to transfer your children to a new school? All the research you need to do in order to choose the best option for them (school rating, population, transportation, credits, track, teachers and school reviews, advantages, disadvantages…) is proof that you’re good at deliberating. Your visits to the grocery store also reflect your deliberation skill. As one of my brothers in law says: “you (women) like to interview the fruits and vegetables, which is why you spend so much time in the supermarket”, and he is not lying, is he? That carefully consideration we moms do before making a decision has helped us to be wiser in our choices. This skill is often underestimated, but it proves that you are equipped to analyze different financial products in order to choose the best financial options in the market. I invite you to carefully check one of your to-do lists. What do you see? It’s okay if you haven’t checked all the items on it. Life is not perfect and we aren’t either. 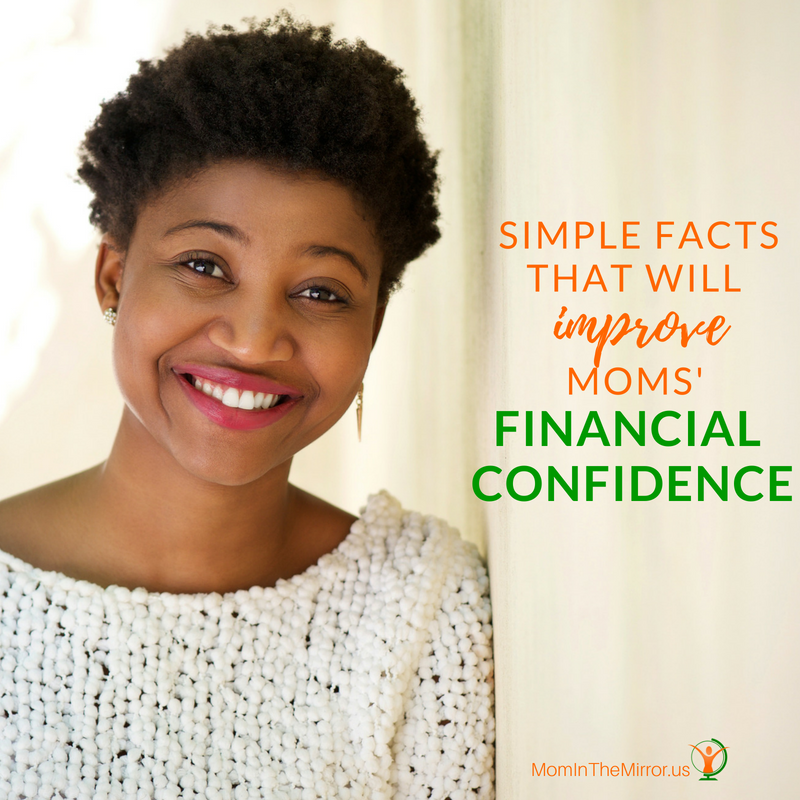 But I can attest that you can manage two or more of the facts above, which are true and will improve moms’ financial confidence if you start giving yourself the credit. Even though you could improve your finances knowledge if you’d like, all of these facts are true to most moms and are evidence that you have what it takes to be in charge of your finances. Are you willing to improve your financial confidence? Share any other activity that you do that also reflects your mastery of finances.